There was a time, not so long ago, when calculators were spurned as the handmaid of the lazy maths student. But according to the latest research, far from hindering young maths pupils, these little magic boxes actually aid them with their arithmetic skills. Academics for the Education Endowment Foundation also found that when taught properly, calculators can help students become better at problem solving. Calculators are most useful, they said, when woven into teaching materials. Ministers banned the use of calculators in national maths tests for 11-year-olds in England from 2014. Announcing the move in 2012, the then Education and Childcare Minister Elizabeth Truss said this would "reduce the dependency on them in the classroom for the most basic sums". She added: "All young children should be confident with methods of addition, subtraction, times tables and division before they pick up the calculator to work out more complex sums." 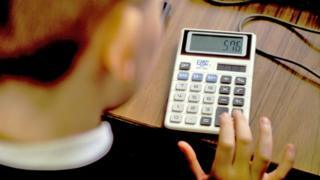 The move followed a government review of calculator use in primary schools. Sir Kevan Collins, chief executive of EEF, which is an education charity, said: "It's often said that calculators can harm students' arithmetic skills. "What this review finds is that they can actually boost pupils' fluency and understanding of maths - but that to do so, teachers should ensure they are used in a considered and thoughtful way, particularly with younger students." But, in this latest research, academics quoted a paper which showed pupils who had used calculators systematically throughout primary school had a greater understanding of and fluency with arithmetic. However, the report added that primary school pupils should use calculators regularly but not every day. And it said secondary school students should be allowed more frequent access to calculators so they can make decisions about when and when not to use them. One of the report authors, Prof Jeremy Hodgen, chairman of Mathematics Education at University College London, said: "It's really important that kids use calculators amongst other methods." He suggested they were valuable in checking calculations are right and mean that pupils can tackle tricky numbers. He said: "Employers really value numeracy, but they don't want people who can just recite their times tables, they want someone who can work out something in the real world. "No-one in the real world would think of calculating 4,271.36 times 289.67 in their heads. "But before they use a calculator they should know that the answer is about 1.2 million, so that if they get an answer which is about 123,000 they have made a mis-key error." Chris McGovern, chairman of the Campaign for Real Education, said there was a place for calculators in schools because they were a useful tool. But he warned: "The problem is that over-reliance on calculators means there are many youngsters who leave school without being able to work out mental maths in their head. "I think it's necessary that children learn their times tables without relying on calculators to give them the answer," he said. A Department for Education spokesperson said: "Calculators can be an important tool when being taught maths but this must not be at the expense of children mastering the fundamentals of mental arithmetic and calculation - a point which the EEF acknowledges." It added that standards were rising in primary school, that it was investing £74m in the Teaching for Mastery maths programme. It is also trialling a new online times table check to increase the number of children mastering the basics of mathematics.